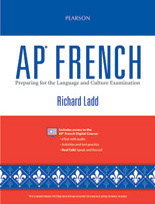 This all-new edition of our highly praised test prep book provides extensive test preparation and practice in the same formats as will appear on the new AP® French Language and Culture Examination. New! With this edition, you can choose between a consumable Student Edition with online support or go all digital! Option 1: Student Edition (soft cover) with 1-year license to the Digital Course. This is ideal for schools that use a consumable model (students write in the books each year and new books are purchased the subsequent year). Option 2: Student Edition (soft cover) with 3-year license to the Digital Course. This is ideal for schools where students do not write in the books and the same books are reissued each year to new students. Option 3: Online Student Edition (eText) with 1-year license to the Digital Course. In this option, students do not receive a print Student Edition; rather, students access the content online through the eText. 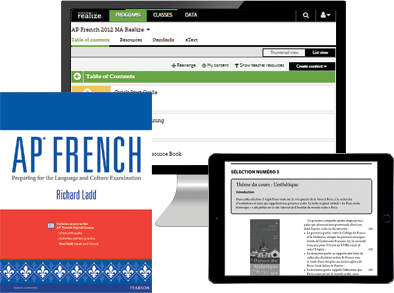 To learn more about Registration, visit MyPearsonTraining.com to find the Video Modules and PDF files that support the Digital Course for AP® French: Preparing for the Language and Culture Examination. Teachers are encouraged to attend an Implementation Webinar by clicking the Webinar button on this page.